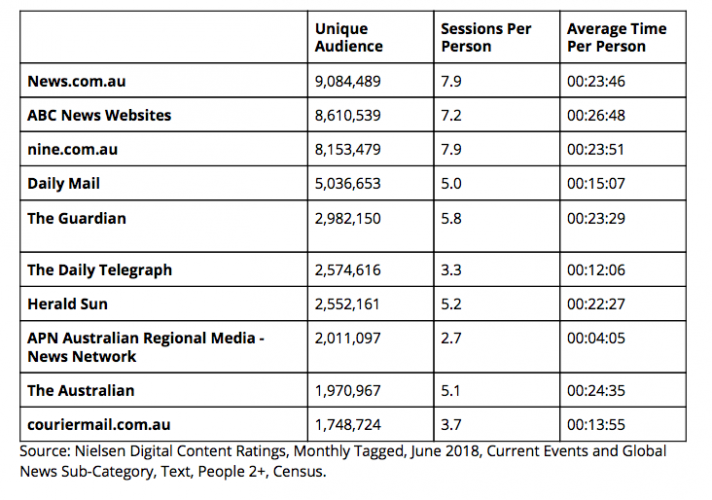 News.com.au remains Australia’s most read news site according to Nielsen’s June 2018 Digital Content Ratings. It was the top news entity in terms of highest unique audience (9.1 million), followed by ABC News Websites (8.6 million) and then nine.com.au (8.2 million). Fourth place was Daily Mail (five million). Next in the Nielsen online news rankings was The Guardian (three million), followed by The Daily Telegraph (2.6 million) in sixth position. In seventh position was Herald Sun (2.6 million), followed by APN Australian Regional Media – News Network with a unique audience of two million. In ninth place was The Australian (two million) followed by couriermail.com.au (1.7 million).